Civility and Kindness at Work. This quote hits home for me because, like most writers I know, I’ve had a number of different careers. I’ve worked in fields with people who had extremely high standards for their own work and for the work of those around them, and yet, the way those standards translated into everyday encounters varied dramatically. I’ll put it out there in the open to discuss: I don’t believe there is any correlation between high standards and competitive work environments. Some of the best work I’ve ever seen has happened in cooperative, kind and thoughtful places. On the other hand, toxic and competitive environments may allow for short-term gains, but those gains are despite the lack of civility, not because of it. There was a time when I was younger–and probably more naïve–when I believed that who I was as a person was entirely independent of the people I spent time with. A few decades and as many jobs later, it’s clear to me that who you deal with on a regular basis impacts your way of being in the world. If you work with people who are thoughtful, gracious and open-hearted, that will rub off on you. The opposite is true, too. Dealing with thoughtless, mean-spirited and close-minded people day in and day out will wear down even the most compassionate person. The people I deal with on a regular basis now–even those whose job it is to critique my work–have personal qualities I want to emulate. Fellow writers are supportive; editors are considerate; agents are encouraging. This is not to say that feedback is all sweetness and light. It isn’t, but even the toughest messages can be delivered with kindness and respect. (Yes, I had to cut four points of view from Blessed be the Wicked despite my arguments to the contrary…and, yes, my editor was correct.) In the world we live in now, I think it’s more important than ever to disagree with civility and humanity. We don’t have to always see things the same way, but we should treat each other in ways that allow for friendship and cooperation despite disagreement. What do you think? 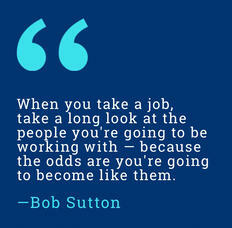 For those of you who have worked in a number of fields and environments, how are you influenced by those around you? How do you influence others?